The Reserve Bank says it's too early to draw conclusions on the impact of its restrictions on low equity home loans, though the early indications are that they have tweaked lenders' behaviour. The pick-up in house prices over the past 18 months is still the biggest risk to the stability of country's financial system, which is still sound, with both banks and households "highly exposed to the housing market," governor Graeme Wheeler said at today's release of the Reserve Bank's six-monthly financial stability report. A shortage of supply, particularly in Auckland and Christchurch, rising inbound migration and low interest rates are fuelling the property market, and the central bank aims to limit that growth with limits on the level of mortgage lending banks can write with less 20 per cent of a property's value as a deposit, which came into force on October 1. "The early evidence shows that banks have significantly reduced high LVR lending approvals, while increasing the cost of high LVR loans," Wheeler said in a statement. 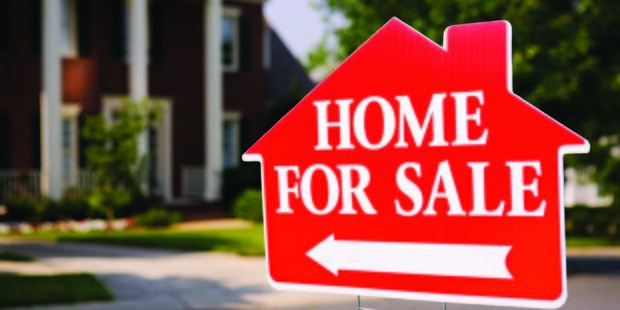 "However, it is too early to assess the impact of the measures on house price inflation." Real Estate Institute figures yesterday showed house sale prices continued to rise last month and were up 9.8 per cent from a year earlier, though anecdotal evidence indicated growth in the volume of sales slowed as buyers were more reluctant to make a decision amid the uncertainty of the loan restrictions. The central bank is concerned that if households take on too much debt, a fall in house prices could leave them owing more on a property than what it's worth, or interest rate hikes scheduled for next year will put them under pressure to service their interest bill. Market pricing indicates mortgage rates will rise to around 7 per cent or 8 per cent over the next two or three years, the bank said. The Reserve Bank anticipates the high LVR loan limits will reduce sales growth by between 3 per cent and 8 per cent, slow house price inflation by between 1 and 4 percentage points, and lower household credit growth by between 1 and 3 percentage points. "There is likely to be a degree of market volatility over the first few months that LVR restrictions are in place, as market participants adapt to the new environment," the report said. "It will not be until property market activity settles down in a few months' time that a clear view of the impact of the restrictions will emerge." The central bank didn't see any material evidence that buyers ramped up their activity in the six weeks between the initiative's announcement and its implementation, and said that may have been down to banks tightening credit criteria to control its pre-approval pipeline in anticipation of the restrictions. The Reserve Bank reiterated that it will remove the restrictions when "significant imbalances in the housing market have abated" and that broader financial conditions, such as monetary policy, will have to be weighed when making that decision. The limits would also be removed if they aren't achieving their desired outcome, or if they create distortions that outweigh their benefits. Real Estate Institute says sales down and builders seek exemption as orders dry up. First-home buyers are panic buying to get on the property ladder since the mortgage lending restrictions came in, property experts say. The buyers are opting for anything they can afford to secure their pre-approved mortgage after the Reserve Bank implemented restrictions on loan-to-value ratios (LVRs) under which most home buyers must have at least a 20 per cent deposit. The comments come as the Master Builders Federation lobbies the Reserve Bank for an exemption for new house builds as building inquiries dry up. Real Mortgages director Stuart Hawes said many first-home buyers were taking anything they could in their price range just to get in the market before their pre-approval could be pulled by a bank. "It was a mad panic when it was first announced," Mr Hawes said. "The phones didn't stop ringing here." He said "a hell of a lot of people are disheartened" and were either quitting the market or getting savvy by using parental homes as security, taking a personal loan, or buying a home with friends. Mr Hawes said it would force many vendors to sell over 30 days by negotiation instead of at auction which was a costly exercise for buyers who had to get inspections, valuations and LIM reports often for more than one property. Real Estate Institute figures out yesterday showed there were 6778 unconditional residential sales in October, a 2.1 per cent increase on October last year, and up 0.9 per cent from this September. But REINZ chief executive Helen O'Sullivan said on a seasonally adjusted basis the volume of residential sales fell 4.1 per cent, indicating that sales in October were not as high as would normally be expected. The statistics came after the Master Builders Federation met the Reserve Bank asking for an exemption for new house builds because of housing stock supply concerns. 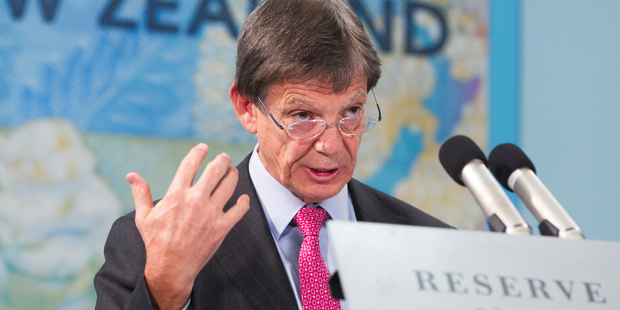 "We are trying to get sufficient evidence to prove to the Reserve Bank that it is actually affecting supply more than they thought and it's counter-productive to what they are trying to achieve, and we are asking for an exemption," said chief executive Warwick Quinn. He said the LVR restrictions had resulted in an immediate drop in sales inquiries with builders which had grown to about one-third of all new builds. People in regions throughout the country were being hit through Auckland's woes, he said. The four properties in Wairau Valley are marked by the red border. Four fully-tenanted industrial properties in the North Shore's popular Wairau Valley are on the market, offering several options for investors or owner-occupiers. The properties on Porana Rd are being marketed by Euan Stratton and Jimmy O'Brien of Colliers International, jointly with Elliott Molesworth of North Shore Commercial. They will go under the hammer separately at 11am on November 27 at Colliers at 151 Queen St, Auckland. "Bite-sized, multi-tenanted industrial properties aren't offered to the market in this location very often, so this is a great opportunity for investors to enter a tightly-held market where there is plenty of demand from occupiers," he says. "We expect to receive interest in the auction room from individual investors looking to buy one or more of these affordable properties to add to their portfolios." O'Brien says some of the properties have short-term lease agreements in place and so they could also suit owner-occupiers keen to find a presence in the Wairau Valley industrial area. "The immediate area is a well-established light industrial area catering to automotive and service industrial businesses which benefit from the excellent central North Shore location and motorway access." * 49 Porana Rd. A 1583sq m site accessed by a right-of-way. It has a 780sq m industrial building, constructed in the 1980s, housing six various-sized individual tenancies. Molesworth says it has an impressive tenancy record over the past 10 years. "With a touch of TLC an astute investor could really add value here." Each tenancy is self-contained, offering workshop space, roller door access, mezzanine areas, offices and amenities, facing a shared open yard for access and parking. Total annual rental income from six tenants is $97,587. * 51-57 Porana Rd. This 3166sq m property, with two separate entrances off Porana Rd, has two business occupiers and a 2degrees cell tower returning $102,250 in annual rental income. Stratton says there are only 600sq m of buildings on site so there is plenty of space for further development. Although the property is on one title, the land has been divided into two parcels. * 53 Porana Rd. A 400sq m building on an 812sq m site with an annual rental income of $51,600. O'Brien says it occupies a road-front position, with three tenancies leased to a cafe, panelbeater and garage. "The cafe has recently been refurbished, resulting in a modern and attractive lunch stop for workers in the area. The property would be well suited to owner-occupiers looking to secure space for their own business while benefiting from some additional income from the other tenancies." * 55 Porana Rd. A 470sq m building with road-front exposure and housing a single tenancy, with ample parking on the 812sq m site. The 1970s building has roller door access, ground floor office and showroom, mezzanine office and workshop areas. Molesworth says the building is functional in nature and could potentially be split into two separate units. Stratton says development in the Wairau Valley area has seen some well-known retail and commercial occupiers move in in recent years, including Pak'nSave and Bunnings. "The demand trends currently in the Wairau Valley have meant there are very few investment properties offered for sale here," Stratton says. "Properties here therefore tend to be easily let with many occupiers queuing up to gain a presence in the locality." Stratton says that associated industrial development occurring right throughout the Wairau Valley - combined with its closeness to the extensive residential catchments of Glenfield and Forest Hill - means its future as a very popular retail and commercial precinct looks assured. The area's central location on Auckland's North Shore, a drive of 10 to 15 minute to the central business district, and proximity to the motorway further enhance the appeal of the area. Industrial property vacancy data from Colliers International Research shows vacancy in the Wairau Valley continues to be very low. Wairau Valley industrial vacancy fell to just 1.8 per cent in August this year, down from 2.4 per cent in August last year. This is lower than the overall industrial vacancy rate in the greater Auckland area, which was 3.4 per cent in August this year and 5 per cent in August last year. Paihia Beach Resort and Spa for sale on the waterfront at 116 Marsden Rd, Paihia, Bay of Islands. Prime waterfront property makes most of a glorious setting in the Bay of Islands. An award-winning accommodation and resort property in the Bay of Islands tourism centre of Paihia is for sale, with the owner keen to exit before the busy Christmas and New Year holidays. "Prime waterfront properties don't come on the market very often in New Zealand, let alone in the Bay of Islands," says Chester Rendell of Bayleys Paihia who, with Michael Pleciak of Bayleys head office in Auckland, is marketing it for sale by tender closing at 4pm on November 28. The 22 accommodation suites within the five-level Paihia Beach Resort and Spa at 116 Marsden Rd are described by Rendell as "more apartment-style than hotel rooms". The resort includes a 40-seat restaurant called Pure Tastes and a health spa trading as La Spa Naturale Day and Hair Spa. "The restaurant and spa are a great complement to the accommodation business so the property does live up to its resort label and we believe it will attract strong interest from tourism operators, individuals and families," Rendells says. "The rooms all have sea views, as does the restaurant and bar on a first level pool deck where there is a big 20m pool and five hot jacuzzis." There are also steam and sauna rooms. The restaurant and bar, spa, reception area and back-of-house facilities are all held as common property. Rendell says Paihia Beach Resort and Spa forms part of a freehold strata title incorporating the hotel units and associated guest facilities. The ground floor contains the lobby and reception area, management office, hotel car parking, bathroom amenities and back-of-house areas including pool plant and storage rooms, laundry and housekeeping facilities, maintenance room, and rubbish and recycling storage area. A lift near the reception area provides access to all floors. The restaurant and bar, including a commercial kitchen, are on level one along with the bathroom amenities and six guestrooms - four poolside studios and the one two-bedroom suite. A studio adjoins another one bedroom suite with interlocking door. Level two has five superior studio guestrooms and a guest laundry and linen room. On the third level are five superior suite guestrooms and a housekeeping/linen room and the top level has five spa studio guestrooms and a housekeeping room. The resort is just across the road from Paihia's main beach. The mainly concrete structure was built in the 1990s and underwent a major refurbishment in 2008. Guest rooms and public areas are serviced by ducted air-conditioning, with individual room controls and there is a full automatic fire sprinkler system incorporating smoke and thermal detectors, dry riser mains, hand-held fire hose reels, fire extinguishers and exit sign. Closed-circuit TV covers various areas. "The entire 2002sq m property has a total of 28 unit titles which gives any new owner multiple options with ownership and structure," Rendell says. "It would be in any new owners' interest to take over pre-Christmas to take advantage of the substantial forward bookings and what is forecast to be a busy the summer season." 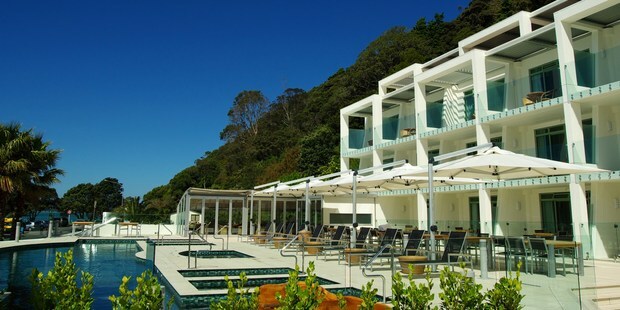 The resort and spa is only about 550m from Paihia's commercial centre, which has restaurants, cafes and ferry terminals to other Bay of Islands' towns and which services local tourist operators. The resort's beachside, mainly level site is on the southern side of Marsden Rd at the intersection of Marsden Rd and Davis Crescent, which is towards the northern end of Paihia. The property's rear boundary adjoins a scenic reserve. Paihia is just 3km south of Waitangi, while the historic town of Russell is on the opposite shore and is accessed by car ferry from nearby Opua. Paihia itself is a three-hour drive from Auckland and Air New Zealand runs daily return tips to Kerikeri with a flight time is 40 minutes. House prices in New Zealand hit a new high in October following strong growth in the country’s two key cities while lending restrictions imposed by the central bank have yet to make an impact, revealed state-owned property valuer Quotable Value (QV). QV's residential property index climbed 8.9 percent in the year to 31 October from its annual rate of 8.4 percent in September. This brings the index to 10.2 percent above the property market’s previous peak in 2007. Housing prices in earthquake damaged Christchurch and in the biggest city Auckland are still leading the rest of the nation, with lack of supply being a major factor. Sir Edmund Hillary's historic family home has been sold for $2.6million - only to be removed and replaced with townhouses. It is the latest example of Auckland urban intensification to outrage residents, who have posted protest banners outside the house as it awaits the arrival of the removal contractors. 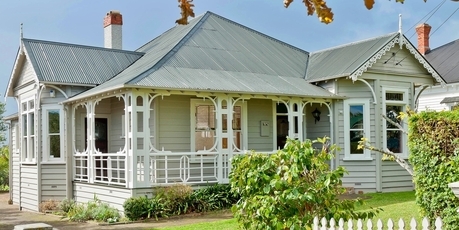 The four-bedroom Mt Eden villa was built for Sir Edmund Hillary's maternal grandmother in 1908, but the new owners plan to remove it from Herbert Rd to make way for three townhouses. Neighbour Fiona McDonald said she was dismayed the house had been bought by a developer, only to be removed. "I confirmed with the council on Monday that they have approved for it to be removed from the site." She said she didn't want to do anything to jeopardise the sale so waited until it was finalised on Friday before hanging a protest banner, reading, "Respect Mt Eden heritage, don't remove villas". "The council made it clear to me there was nothing I could do to prevent it being removed. It's an absolutely stunning villa, inside and out. It is disgraceful that the council lets it happen, and so easily." The property was sold by artist John Horner and his wife Jeanette Hayward for $2,615,000, nearly $1 million above its 2011 government valuation of $1,650,000. Horner said he found out about the property's future a few weeks ago. "Originally we didn't think anyone would move the villa," he said. "Herbert Rd is not a heritage street such as Burnley Tce and it's listed as 6A which (means) you can do what you want with it." The historic villa was being relocated to Warkworth to become another family's home, Horner said. "It's a nice big section. It's the best scenario if they're going to move it, is that we know where it is and that it's going to a good place." The property was bought by "Chinese buyers", Horner added. "I don't think it's the buyer (that's to blame). His intentions are good and we have a good relationship with him. I think the architect had the designer building three properties there." He and his wife had lived in the Herbert Rd property for 22 years and raised two daughters there, he said. They sold the property to free up cash as he was retiring after 30 years teaching at Whitecliffe College of Arts & Design. A three level commercial building for sale at 39 Anzac Rd, Browns Bay. Three North Shore properties including high-profile buildings in Browns Bay and Milford, and a popular corner retail outlet in Hillcrest, are up for auction on the same day next month. They are among 15 properties featured in Barfoot & Thompson Commercial's final Insite portfolio for the year which includes a three-level Symonds St corner office building and a New Lynn garden centre. They are also going under the hammer at the same auction at 10.30am on Thursday, November 14. "The building at 39 Anzac Rd occupies a wonderfully prominent position on the northern side of the intersection of Anzac and Glen Roads in Browns Bay township," says Gary Seekup of Barfoot & Thompson Commercial, who is marketing the property with colleague Tim Bibby. The three-level property, which will go under the hammer at the agency's Auckland CBD auction room at 34 Shortland St, comprises five separate stratum in freehold unit titles on a land area of 1037sq m and generates annual income of about $117,000 plus GST. "Anzac Rd is one of Browns Bay's main access roads while Glen Rd is a smaller road bordering the township's commercial and retail areas," Seekup says. "Being a corner site, the property has good traffic exposure and there is a good level of on-street car parking that is not always available in the centre of the shopping area." Bibby says the site is about 250 metres to Clyde Rd, Browns Bay's main street, and a few metres further to Browns Bay Beach. "The property is zoned Residential 6C1 with a height restriction of eight metres but under the Auckland City Council's Unitary Plan it is proposed to lift this restriction to 16.5 metres and rezone to Business mixed-use zoning," Bibby says. The regular oblong shaped site has a 18.76m frontage to Anzac Rd and a 55.32m frontage to Glen Road. "The site rises gradually from both roads to give it an impressive profile to the building." The tenants include Lewis Callanan Solicitors, Browns Bay Physiotherapy Care, St Mark Law, Beejay Browns Bay, Financial Success Group, InsuranceFind and Dimitri Galaktopoulos. The various leases have final expiries ranging from June 2015 to November 2020. Bibby says part of one unit within the complex comprising 27.82sq m is vacant, with one entire unit having an area of 154sq m.
In Milford another multi-tenanted high-profile building, on the seaside suburb's main road, is also being marketed by Seekup with colleague Bruce Jiao. Seekup says the 296sq m property on a 261sq m freehold site at 83-85 Kitchener Rd is fully tenanted and generates income of $60,222 net per annum. It is zoned Business 2 under the North Shore Operative District Plan. "This is a two-storey commercial building comprising ground-floor retail space separated into two tenancies and a first-floor retail showroom," he says. The tenants are Talay Thai Restaurant, Claire Stredder and Carnival Costumes Hire. Jiao says the building occupies an almost rectangular road site with a frontage to Kitchener Rd of 12.2m and an average depth of 21.1m. "Kitchener Road is a busy street with a constant pedestrian flow that has been boosted in recent years by the redevelopment of the Milford Shopping Centre with its supermarket and food court," Jiao says. "A wide variety of stores in the centre include anchor tenants The Warehouse and Whitcoulls and serve the Milford, Westlake, Forrest Hill and Crown Hill regions with the wider catchment taking in the greater North Shore urban areas including Takapuna." To the west a well-patronised corner retail property at 23 Ocean View Rd and 2 Hillcrest Avenue, Northcote, will also go under the hammer in the November 14 auction. "This is a two-storey building constructed in the 1950s on a prominent North Shore corner," says David Mayhew, sales manager of Barfoot & Thompson's North Shore Commercial office who is marketing it with colleague Nigel Hall. The property has two established ground-floor retail tenancies with a floor area of 680sq m plus first floor amenities and offices of 247sq m.
It generates annual income of $295,809 gross of council rates. The freehold flat land area of 2861sq m is in two titles. Originally occupied in 1952 by the Morris Supermarket, 23-25 Ocean View Rd houses the building and comprises 2155sq m with a Business 1 zoning. The 2 Hillcrest Ave site is a 706sq m area that provides car parking and has a Residential 4A zoning. "While the car parking area enhances the shopping experience for the customers of the two stores, a new owner could explore the possibility with the council of building more retail or commercial premises," says Mayhew. The three tenancies comprise Simply Fresh, a 45-year-old fruit and vegetable business, and a Mad Butcher outlet, both on five by eight year leases from September 2012; and an upstairs office on a three by eight year lease from September 2012. "In 2009 the Mad Butcher tenancy was completely rebuilt to a high standard by amalgamating the old bakery, dairy and the takeaway tenancies," says Mayhew. "It should also be noted that the property has been re-presented to the market with engineering plans and has a written quote from Eagle and Franich Construction with costs to bring the building up to earthquake standard. "The vendor has agreed to complete all the earthquake strengthening work to bring the property up to earthquake standards with two years of settlement and has agreed to have a portion of the sale proceeds retained in the purchaser's solicitor's trust account as a guarantee that the works will be completed. "The location is 100 metres from the major intersection of corner of Lake Rd, Northcote Rd and Ocean View Rd with all three of being primary feeders to well established residential areas. "It is about 3km to any one of three State Highway One motorway entry/exits and only 10 minutes from the Auckland CBD in off-peak traffic. "The town centres of Northcote, Birkenhead, Glenfield, Beachaven, Birkdale and Takapuna are all within a 5km radius." Mayhew says the long leases, lengthy retail history and two well-established businesses make the property "ideal for a passive investor looking to cement a strong cash flow with nominal input". Over the harbour bridge, Barfoot & Thompson Commercial agents Wayne Muir and Kim Loo are also marketing a property for the November 14 auction. "This three-level building at 124 Symonds St, Eden Terrace, in the Auckland city fringe, is on a freehold 155.9sq m site and is being sold with vacant possession," Muir says. "The building has a total area of about 465sq m over three similar levels and is at the intersection of the Symonds Street State Highway One motorway off ramp and the eastern side of Symonds Street. "The position is elevated with extensive views from the building over Auckland city and the harbour with the elevation ensuring the views can't be built out because of the intervening motorway complex and Grafton Gully." Muir says the land is zoned Business Activity 8 - a higher intensity zone designed to promote site amalgamation, planned business centres and to cater for a wide range of business and residential activities. "There is only a limited supply of this zoning in the city, which can be a benefit in the future." Loo says the building is constructed of concrete block, concrete precast floors and Dimondeck iron roofing. "It appears to be well maintained and has been further upgraded by polished concrete floors and decoration along with upgraded toilet and bathroom facilities. "The property is within 800 metres of Queen St and Upper Queen St and public transport is available outside the door. "Motorway access north and south is also nearby as is the route of the proposed inner city rail link." 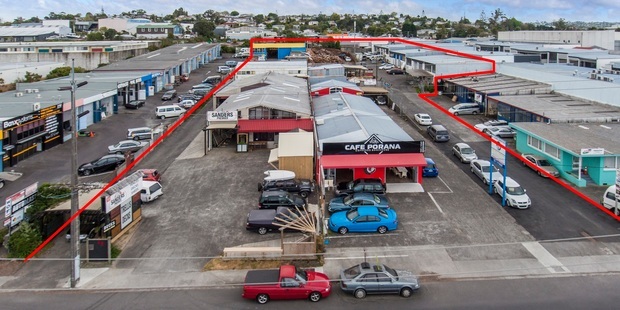 To the west, a fifth property to be offered at the same auction next month comprises a near flat site operating as a garden centre and cafe in New Lynn. Agent Agnes Teh says the 10-12 Margan Ave property "represents a superb investment proposition for investors and for developers". The property has a net lettable area of 1187sq m on a 2214 freehold site and has two tenants paying a total of $85,000 annually. "It is situated close to the New Lynn Town Centre, train station and transport centre," Teh says. Leases to the garden centre and a café both expire in January 2015 with rights of renewal for two further terms each. The former BNZ tower at 125 Queen Street. Naming and signage rights are available on the 30-floor former BNZ Tower building at 125 Queen St, along with its street-level retail area and first-floor office space. "My focus is on securing established businesses primarily within the fashion, banking, electronic and hospitality sectors for the retail level or ideally a larger department store operator," says Ray White Commercial retail and hotel specialist Brice Clark, who is marketing the available space for lease. "The floor above the retail level also represents excellent potential for associated office use." Clark is seeking tenants for the 1166sq m ground floor retail area and first-floor office space of 1065sq m.
"With Prada and Christian Dior shortly moving into refurbished premises in downtown Auckland to take advantage of the increasing cruise ship and tourist market, we believe the large, vacant retail and office area within the former BNZ Tower is likely to attract another international tenant," Clark says. The tower, completed in 1984, was built for the Bank of New Zealand, and retained the facade of the first bank building on the site in the 1800s. It was one of Auckland city's most distinctive buildings in the 1990s, when it housed not only the BNZ but also Australasian legal firm Minter Ellison Rudd Watts, which has moved to Shortland St. BNZ moved across the street into the Deloitte Centre at 80 Queen St when the 21-level building was completed in 2010. Clark says that during the time the ground floor and first levels of 125 Queen St have been vacant, the look of downtown Auckland has changed. "Neighbouring businesses are now Gucci, Louis Vuitton, Swarovski, Mont Blanc and Michael Hill Jewellers, and Prada and Christian Dior are soon to arrive on the scene," he says. "The office tower already houses New World Metro, one of the company's best-performing supermarkets in New Zealand, which takes advantage of the CBD residential population as well as visitors wanting to do a bit of grocery and wine shopping. "This precinct in Queen St around Shortland St, in particular, is home to some prestigious international brands and is an area which is also head office to some of New Zealand's largest corporate, legal and commercial services." Clark says the former BNZ Tower contains one of the few spaces for lease of comparable size in Auckland's main street. "Once it is leased, space of this size in Queen St is unlikely to become available again. And a new tenant would have the option of taking up naming rights. "This is absolute prime retail real estate. It is close to the harbour with its growing influx of cruise ships, near to Auckland's central public transport network and only a short distance from the Britomart food and fashion hub. It is all these factors that are attracting the established, high-end, international retailers." While the floor plates are more suitable for large format multi-national retailers, Clark says he is talking to international brands that are interested in the building. "The space could also be subdivided for smaller operators. It has some natural splits in the retail space, multiple access points and frontage on three faces of the building. Parking is available on levels two and three, and there are parking buildings nearby." Clark says there is always interest in space on Queen St and very little of it available. "The leasing market overall is looking better than it was a couple of years ago and now the economy has improved, there is renewed interest in this building, especially the two floors currently available." The Waihi Motor Camp, set next to Waitete Stream, includes onsite recreational facilities. Set in parklike grounds with mature trees, ponds and a stream, the Waihi Motor Camp at 6 Waitete Road, Waihi, is to be auctioned next month - presenting the chance for a new owner to walk in and take over an established turn-key business and lifestyle property. "This sale presents a golden opportunity for a buyer to buy an accommodation facility located within easy access to the newest section of the Hauraki Rail Trail - a popular three-day recreational cycling track," says Sharleen Adams of Bayleys Tauranga who is marketing the property and business for sale by auction on sold on November 13. The freehold camp is built on a largely level site and has a range of accommodation types including: 52 powered caravan sites, 40 camp sites and 12 cabins, some of which are self-contained and backpackers' lodgings. Lighting and water are supplied throughout the park and the camp is equipped with toilet and shower facilities, and a kitchen block at its centre. Waihi Motor Camp occupies 1.25 hectares of the 3.1ha property which is for sale in two titles encompassing the motor camp itself on one title and the owner/manager's property on the other. Forming a backdrop to the park, the Waitete Stream flows through the western side of the property and serves as a popular swimming hole for patrons in summer. "Sheep graze on a series of paddocks in the property, adding to the atmosphere," Adams says. "Recreational attractions include an outdoor pool, and children's play area with a swing and trampoline." The three-bedroom owner's residence is set away from guests on an elevated site overlooking the camp grounds. On the western side of the house is a formal entry and camp office. "The private owner/manager's grounds include spacious indoor and outdoor living with plenty of room to entertain friends and family - along with having raised vegetable gardens," Adams says. "Bookings are particularly busy in summer when the camp is a popular destination. A new owner could move in and immediately start taking reservations for the upcoming summer months. With beautiful beaches nearby and typically warm temperatures, the region is a real drawcard for families and other holidaymakers." The land is zoned Residential and the existing use complies with zoning under Hauraki District Council regulations. "The completion of a section of the Hauraki Rail Trail in the Coromandel linking Waikino to Waihi is tipped to significantly boost tourism to the region, benefiting a number of local businesses - including this one," Adams says. Known as the country's easiest riding trail, cyclists are attracted to the 82km trail all year round because of the temperate climate on the Coromandel Peninsula and the Hauraki Plains, and the stunning scenery throughout the ride. The Hauraki Rail Trail follows the path of two historic railway lines, running from Thames to Paeroa and Waikino to Te Aroha, with a new path linking Waikino to Waihi. The new 7km section was officially opened last month. "The completion of the newest section of the Hauraki Rail Trail was great news for local businesses because it will attract further tourism dollars to the area," Adams says. "Waihi Motor Camp is in an ideal position to accommodate cyclists undertaking the trail. The camp is located close to main thoroughfare State Highway 2, only minutes from the township of Waihi. "With a growing number of visitors now arriving in the town, the current owners view it as an ideal time to hand over the reins of the accommodation business to a new owner to take advantage of these opportunities. "But it's not just the rail trail and Waihi's sandy beaches that draw a variety of tourists and visitors to the Coromandel and Bay of Plenty tourism regions." The Waihi area is famous for gold mining with miners first attracted to the area in the 1800s. Three working mines remain in operation and gold mining remains a major attraction in Waihi, with regular tours operating in the area. "The location is ideal from a tourism perspective as it is centrally located to many well-known attractions including bush walks, golf courses, retail outlets and restaurants," Adams says. Other visitors are attracted to the region by its thriving business and rural industries including dairy farming, tourism, horticulture, viticulture and forestry, and housing. A small family owned business with good income potential is for sale in Rarotonga, Cook Islands. There are so many opportunities for anyone looking for a lifestyle change or a retirement home with income potential. Something for all the family to get involved in and well worth further investigation. The plantation was granted operating approval by the Cook Islands Business Trade and Investment Board on 26 February 2010 for the purpose of carrying on business as an exotic fruit orchard, permission to operate the plantation as a tourist attraction, and fruit tree nursery sales. This visually stunning property was designed and developed by top consultants to the tropical fruit industry who have worked in Hawaii, Australia and New Zealand. Basking in the sunny southwest region of Rarotonga, your senses will be tuned into the sights and sounds of being on a tropical island. The fully furnished 4 bedroom ranch style home features prominently at the back of the property. This elevated part of the property enables the capture of expansive views of the Pacific Ocean and out over the tops of swaying coconut palm trees that rim the coastal beaches of the Cook Islands.